One would guess that the highest stakes chess game in the country would perhaps be the final round of the World Open, or maybe the last round of the US Championship. I think that most would find it especially surprising that one of the participants in this game was a 21-year-old who had never played a rated chess tournament in his life, and probably was rated around 1000 USCF strength. It all started a few weeks ago, when a young professional poker playing friend of mine named Danny (The names in this article have been altered) asked me: “How would you do against a beginner at chess if you started without a rook”? I told him to define beginner, and he said that he meant someone that perhaps played a bit for fun, but had never really played seriously. I told him that I would win virtually 100% of the time. The conversation continued and the basic gist of it was that his roommate Tony felt certain that he could beat anyone in the world if his opponent started without a rook, and he was willing to wager a lot of money against his roommate on this assumption. Now I’ve heard many proposals and stories like this in my time, with people who have limited understanding of chess believing something for no real obvious reason. However those stories usually don’t end up with said person risking $50,000 on a chess game against someone whom has been playing his whole life. Late in June after spending weeks in Vegas for the World Series of Poker, I was set to go home in a few days. Danny contacted me, telling me that his friend was ready to play on Wednesday evening if I was able. I delivered the sad news that I was leaving on Wednesday morning, so I would be unable to play. After some negotiation and begging (I think Danny realized he was a huge favorite here) I agreed to changing my plane flight to Thursday but also to demanding 10% of the purse if I should win the match while also demanding $2,000 in compensation for my time if Tony should somehow back out of the match. I absentmindedly neglected to tell Danny that there were probably quite a few other strong players present in Vegas who would be glad to play a chess game for perhaps a bit less money. Please note that I wasn’t going to actually risk $50,000 myself. There were far too many uncertainties for me to risk this kind of money. If my opponent simply happened to be a 1600-1700 level player, I would be a huge underdog to win, and given that I didn’t know Tony at all, how was I to accurately determine his playing strength. This was simply going to be a bet between roommates. The only difference is that instead of betting $5 or perhaps betting on who pays for drinks the next time they go out, they were going to be risking about a year’s salary for an average person. Both of the 21-year-old roommates have been very successful in the poker world, and while the $50,000 loss would sting, it wouldn’t drastically alter either of their lifestyles. However it was not a great example of bankroll management. Bankroll management is a poker term that basically means that you shouldn’t put too much of your money at risk in a single event or game. I think that a good number is something around 100, meaning that he shouldn’t risk anything more than 1/100th of his wealth on this game. I don’t believe that Tony has 5 million dollars, but even if he somehow did, risking this kind of money on something he knows very little about is really a bad idea and could lead to terrible problems in the future. There are a ridiculous number of poker players that I've seen win huge amounts of money and go broke shortly thereafter due to making large and outlandish bets. This is often followed by some kind of drug addiction, depression etc etc. Of course they don’t usually show this side of poker on TV. Given that there are impressionable youngsters reading this, I want to make sure that they realize that gambling for large amounts of money is extremely dangerous. It takes a very special personality to be able to deal with the lifestyle, and if you aren't that kind of person it can really destroy you. Anyway I arrived at the site of the match, a luxurious home in Vegas, occupied by dozens of young poker players whom I had talked to online over the years, but was just meeting that night. The place was decked with a giant outdoor swimming pool and even a small movie theatre, complete with a projector. They even had their own personal assistant who would stock the house with anything they asked for. It turned out the match would be delayed a bit because Tony was “stuck”. In poker terms that means he was down a lot of money, and a lot of people have trouble quitting when they are losing. I don’t know the exact figure that he was down, but it was a lot. Finally the match was set, and as per the terms, there was to be a "practice" game first, in which I would start without a knight. As in most practice games, we were playing for $5,000. I would get my usual 10% if I won. Some rules we used were very peculiar, but because they were the ones risking the money I had no problem with them. 1. The time control for the practice game would be G/45 (the rook odds game would be G/60). If Tony should go over on time, he wouldn’t lose the game, but would instead be allowed to think as much as possible, yet pay a fee for every minute he went over. The fee was rather substantial so there was incentive for him not to run out of time. 2. No move was complete until a player hit the clock. One was allowed to make a move, leave it on the square he intended to move it, and stare at the position as long as they wanted, while retaining the option to make any other move. 3. Before the match he also took a black pawn and put it on c4, put a white pawn on d4, and asked me if he was allowed to capture it via en passant. I informed him that this would be legal. This was another good omen for my chances. 4. Lastly I asked him whether or not I should call “check” if I was attacking his king, explaining that it wasn’t commonplace in serious chess tournaments, but that it was fine if he wanted to. He said that I should do so. 5. Before each game we would flip a coin to determine what color I was, and then we would flip another coin to determine whether I lost my queenside rook or my kingside rook. The flip for the practice game resulted in me receiving the white pieces and starting without my queenside knight. At about 9 pm, with about 15-20 poker players watching, the match began. Position after 2...f6- note White is missing his knight on g1. 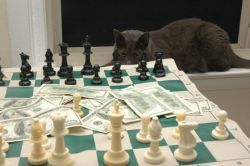 Already things are looking bad....with my next move I actually predicted (hoped for) the next 4 moves. At around this point Danny offered an extra $2000 giving 2–1 odds that I would win. This meant that he would risk $4000 but only gain $2000 if I were able to win the game. Tony countered with 4–1 odds and they agreed. Probably not the best decision ever. 7....Nc6 and I would have 8. Bh3 mate available. I felt it would be poor form to checkmate him in just 8 moves and may discourage any future action, so I made the perfectly reasonable 7.0–0 instead. I understand that this is very shameful. After this game it was clear to me that Tony was in big trouble, yet he still seemed relatively confident that a rook instead of a knight would make the difference. Danny talked to me after the game, and being the good friend and roommate that he is, he tried to ask me what more odds I could entice Tony with because he was going to try to get Tony to raise the stakes as much as possible. Danny’s original motivation for the bet was that he felt Tony was way too cocky in areas he knew nothing about, but now it seemed he just wanted to win as much money from him as possible. The world of poker is a very strange place. After an extremely long negotiation period, the bet was finally altered. Tony had lost a little bit of confidence but made a few comments about wanting the match to be best out of three, to reduce “variance”. This is another poker term that means the favorite will be more likely to win in a reduced variance situation. For example if Garry Kasparov played one game against a 2600 rated Grandmaster, he could lose by accident. If he played a 100 game match, he would win every time, thus resulting in reduced variance. For this opponent, Greg would agree to queen odds. I felt this was a good deal for me, but I didn’t want to sit there all night without being rewarded for it. So I said it would be fine but that I needed to get an extra $2000 out of the deal. Of course I have been willing to play chess games in my life for less than $2000, but I’m probably going to make Danny a year’s salary in one evening, so I felt it was within my rights to demand more for a longer match. At this point I was even confident enough to put the money up myself. In the end the bet on this match went from $50,000 to $55,000, with my cut going from $5000 to $7000. Given the various sidebets that occurred and the earlier practice match, my take if I were to win would be $7800. We took about an hour break to go to In’ N Out Burgers, and came back around 11:30 pm, ready to begin the main event. I was unhappy to see this, I felt like I would have an easier time of things if he captured on c4. In reality though I was pretty unconcerned after the first game. Very surprising. Tony was doing little to dampen my optimism that he had little chance to win. I felt at this point that I would have a completely winning position in about 5 more moves. I had made a little calculation which I felt would give me an easily winning position. If 14...Qb3 I would play 15. Nb7, and I found it very unlikely he would see the dual threats of 15. Qxd7+ and 15. Na5 Qc2 16.Bd3 trapping the queen. Wow. I believe he played this move by accident, but it was really frustrating that I couldn't win instantly. If 15. Nf5 or Nc8+ he can simply respond with 15...Kd8. Of course its always tempting against such an opponent to play a move like this and hope they don't see something, but I still felt certain that I would win if I didn't do anything hasty, so decided to keep the tension. For the only time in the match, I actually overlooked a move that my opponent saw. I assumed this would never happen under any circumstances, so I was a little rattled. I simply didn't see 16....Qd4. Oops. This game might not be so simple after all. He's playing about 20 times better than the first game, but part of me believed it was accidental, as he seemed so tentative and unsure with every single move he made. I could have tried to play 17.Bc3, although I felt that my best-case scenario in that variation would be a relatively dry endgame down two pawns. Yes I would probably win, but I felt my edge goes up a great deal if I keep things unbalanced. My instincts proved to be correct. Now I was certain I would win again. Once material becomes approximately equal, the game is over. I had the fancy option of 21. Rxa7, but felt that he was smart enough to know that I'm not simply giving up a rook for nothing. If 21. Rxa7 Rxa7 22. Ne8 leads to mate after 22....Kg5 23. Bd2 Kh4 24. g3 Kg4 25. Be2 #. I was a bit concerned that his rook gets activity after 21. Rxa7 Ne7 but admittedly I should be winning too. In any case 21. h3 was simple and was going to restore material equality. For some reason I felt very proud of this move, despite the level of my opponent. I always like retreating my pieces backwards to my back rank. It reminds me of a Tal game in the Winawer French where he used the same maneuver. Mainly it allows me to play 27.Ba3 after 26...Nc5, so that he doesn't win my e4 pawn. A much tougher game than I expected after the practice game, but he still made too many blunders. I felt pretty happy about this game, but it was a lot more difficult than I expected it to be. The problem for Tony was that he was almost certain to blunder a few times during each game. All it takes is one big blunder and the game is over, and almost every single move that we make, his advantage will become smaller and smaller. The game ended at about 1:30, and Tony needed a break, so we actually didn't begin the 2nd game until around 1:45 or 2. In the remaining two games, if they should both be necessary, it was agreed that Tony would receive the white pieces (this was part of the contract when we extended the match to three games). It was clear someone taught him some basic opening setup in between games. I'm not certain that this was the best choice, perhaps a normal developing move would have been superior. I was overcome by my desire to win the game quickly, and I imagined some kinds of mating scenarios. I felt pretty good here because if he castles kingside I can win the h-pawn after ...h6, while if he castles on the queenside I have a ready made attack with ....b5, Qa6 type moves. Of course this attack shouldn't work, but I felt that any semblance of an attack should be enough against someone with so little experience. He made the move 12. Na4 first but then realized his mistake before hitting the clock, as ....b5 traps the piece. I was very happy about this move as it gives me the chance to instantly win his queen with 19....Nd3. It's been a long time since I played a serious game against someone where such hopes were not futile. I was actually a bit surprised he saw my plan, although I'm not 100% certain he did. He did make this move relatively quickly however. 25...Nd3 is tempting but I didn't see any forced win. ....Qa3 looked completely crushing and also kept the tension, often a good thing against a weaker opponent. I was surprised I didn't have an immediate mate here, but took solace in the fact that I was almost certainly going to win while also having about 30 minutes left to my opponents 7. And my opponent, down to about 30 seconds, lost in a few more moves. On a post match shopping spree. With great relief the match was over. Immediately after its conclusion Danny had 78 $100 dollar bills ready for me, which he counted out in groups of ten on the table. I have to admit that I was satisfied by the swift payment. Tony was very relaxed and courteous for someone who had just lost $50,000. He had lots of questions about the game and about what I thought my true chances were in the match. When he asked whether I thought he had a 1 in 20 chance to win, I didn’t know what to say. I worked so hard during the games that I felt some sense of danger. Whenever you work hard during a chess game you need to worry a little bit. However looking back, it’s hard to imagine him actually winning. He simply has to survive so many pitfalls and then after all of that he has to demonstrate the technique to beat me from a winning position. My guess is that in general a 2400+ player should be able to give rook odds to someone around 1200-1400, and knight odds to someone around 1400-1650. I’m not sure of the exact figures but this would be my rough estimate. This match made quite a stir on online poker forums, as both of the involved parties are well known Internet poker players. The entire match was a surreal scene, as I remember my younger days of playing relatively good players for anything from $2-$10 per game, and being extremely happy winning maybe $50-$100 from playing chess. FM Mike Shahade was the only chess hustler around the WSOP, and he's not even a hustler! Also as a final public service announcement, if you are a chess hustler or simply someone who is pretty good at chess that also likes money and you don’t set up a chess board outside of the playing hall at the World Series of Poker, you are missing a big opportunity. There are people there who have no idea of how to play chess who will gladly fork over anywhere from $10-$200 to play a relatively quick game. For only one day during the event someone had a chess set setup outside of the poker room. My father, whom is rated about 2250 USCF, sat down and played a few games. There was a line of people ready to play him blitz for $10 per game, and they would have certainly paid more. At one point a man who knew very little about chess said to my father “It would be an honor to play you for $200”. When’s the last time you heard that in the skittles room?